When my kids get off the bus from school every afternoon, they are HUNGRY! 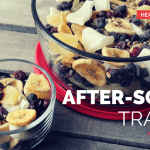 No matter how much I pack them for lunch, it never fails that they are practically starving by the time they get home, and I needed to find some healthy kids’ snack recipes to make for them. Luckily, during the summer at Vacation Bible School, we had the yummiest trail mix one day at our snack time. 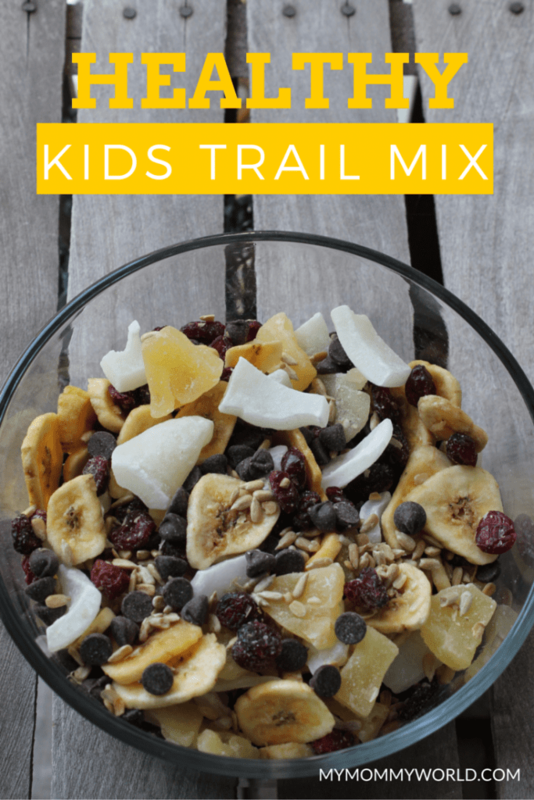 Normally, I am not a big fan of trail mixes, but this one was definitely tasty! In fact, it was so good that I decided to try to recreate it at home so that we could eat it all year-round. 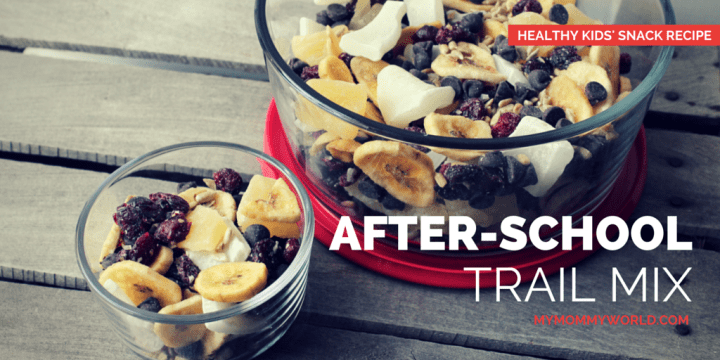 Although this recipe contains a lot of healthy goodies, like dried fruit and nuts with healthy fat and protein, it also contains a little sweetness to make it seem more like a dessert than a healthy kids’ snack recipe! I found all the ingredients at my local Aldi, although I’m sure you can find these ingredients in most any supermarket. I like the big pieces of coconut that Aldi carries, but you can also use regular flaked, sweetened coconut, like we did at VBS…it worked just fine. One mistake that I made the first time I shopped for this recipe was that I accidentally bought the salted variety of sunflower seeds, and it made the mix taste funny. Unsalted sunflower seeds are definitely the way to go! Measure together the dried pineapple, dried banana chips, sweetened dried cranberries (I used the low-sugar variety), sunflower seeds, coconut and chocolate chips in a large bowl. Stir to combine evenly and it’s ready to enjoy. My kids have been devouring this snack after-school and even asking for it in their lunch boxes. I think that the small amount of chocolate chips makes it feel more like dessert to them, since mom doesn’t let them have sweet treats until after dinner. Measure all ingredients into a large bowl, stir to combine. What other snacks do your kids enjoy?